Earlier this week, we covered the topic of digital marketing on two fronts: (1) how the term “digital” will become somewhat of a redundancy in the near future, since digital is taking over everything, and, (2) that content is, has, and will continue to dominate this digital marketing space. 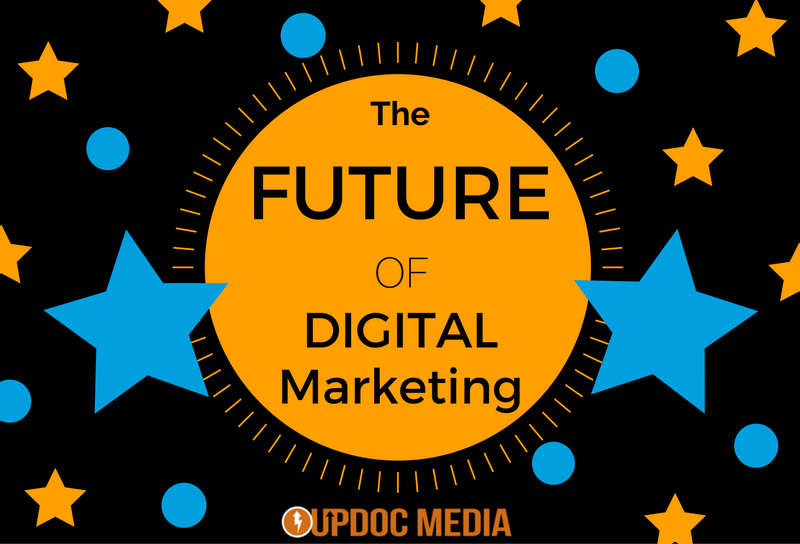 Today, I want to share some thoughts on the future of digital marketing. And, in terms of physical therapy business and how it must leverage digital marketing — keeping an eye to the future is not just being competitive, it’s critical to your business! SEO/SEM has become truly interesting as of late, primarily because of the incorporation of user generated preferred algorithms (including some powerful recent coding which has been designed to kill click bait). All this has changed the game of keywords, and, counter-intuitively… has made it far more complex than it ever has been. Even at present, things are changing because it is no longer good enough just to have keywords and phrases on a website, alone. Every aspect of your online presence must reflect the same content and brand congruency. This means whatever is on your website must match consistently with your social media, ads, search returns, and extended media platforms. It means, all these footprints must tell a unified story, all going in the same direction. 2. Think Digital Footprint and Digital Footprinting. Where you’ve been. And, where you’re going. Since UpDoc Media launched, we’ve been very strong on the concern of one’s digital footprint. In a word (or two), this is the future of digital marketing. Currently, digital marketing is more or less seen as various marketing channels which are unified by an over-arching digital marketing strategy. However, the future will be the reverse. The future holds that a company’s digital footprint will become the central concern; that the pieces which make the imprints are unified in daily tactics as well as long term synergies in channel productions. 3. Walking In The Same Direction. Expanding on the point above, making sure a company has content congruence across its digital footprint will become a daily task. Marketers will do this for a very considerable chunk of their available time. In addition to this, content flow will need to be curated in a way where channel synergies are created. The future of digital marketing will not longer be about inbound vs. outbound or paid vs. organic. ALL these directional flows will need to be done in a way where each points to the next; paid content is confirmed by organic conversations — inbound traffic is precisely matched with outbound segmentation. After all, it is only through such an approach that SEO/SEM results will bring desired audiences to the same place, every time. 4. Presence Will Not Be Enough. In time, everyone will have a digital footprint. Everyone will have a site, a blog, a YouTube channel, social media, a podcast, email campaigns, etc. etc. etc. Some may even have tends of thousands of followers. However, all this won’t be enough. We’re at an age where clicking things and tapping on links is just habit. Everyone does it. We don’t even think about it. See something? “Sure… I’ll like it.” In fact, a strong majority of social media users tend to engage favorably with links that they don’t even open for themselves. That means there’s a bunch of sharing, liking, retweeting, etc. without people even reading the shares they are recommending to their own social circles. So, if not presence… then what? Story. Belonging. Community. 5. Your Digital Footprint Must Share A Journey. The future of digital marketing will go beyond the face value of your digital outlets. It will be all about the path, the journey, the story of how your digital footsteps unfolds, crosses, and walks alongside your customers’. Much as when print media was the standard; where everyone had a newspaper, everyone has a mail out newsletter, everyone had a Yellow Pages ad, and everyone had a magazine — the presence was no longer enough. It was the experience of the content; primarily, the sharing of experiences, journeys, memories, and key moments which kept audiences engaged. Digital marketing has entered such a state of ubiquity. Consistent content will become pivotal. Brand experiences will become absolutely crucial. It will not longer be the “what” that differentiates; it will be the “how” and “why” audiences should remain loyal to you. The best answer: Because, you are loyal to them… their needs, their desires, their demands, their preferences, their values… all to deliver above and beyond expectations along a shared journey which create true engagement and brand loyalty. When considering the best ways to implement digital marketing in physical therapy, the playing field becomes truly dynamic. For physical therapy and physical rehabilitation, this will shine beyond any other context in the healthcare industry. Why? Because, the stories of rehabilitation, recovery, and restoration are POWERFUL & easy to relate to. Everyone has lost something; gaining “it” back, is a win for the underdog — which means, it’s a win for everyone. To get ahead of the curve and to prepare for the future of digital marketing in physical therapy business and practice, consider building now: the framework needed for content congruency; the curation of digital footprinting so that all your channels create strides in unison; all to tell a story and invite target audiences on a meaningful lifelong journey, together.